Last night I had a long battle in creating this nail art. A braid like nail art using three nail polishes from Caronia, Trance (metallic purple), Blue Chill and Baby Pink. 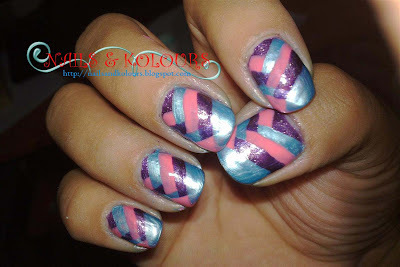 This is one tricky nail art but believe me I enjoyed creating them on my nails, thanks to the tutorial from Youtube. It's really easy to make but because of several over coating of nail polish the drying time took longer than usual. I allowed the design to dry up first below applying top coat. I was able to watch 3 episode of Me Too Flower (a korean drama) while waiting for it to dry before hitting the bed at 1 o'clock in the morning. Sorry for the photos, my hands were very untidy, I wasn't able to clean up the excess polish. I had to take pictures right away before I bump into something and damage my nails. The two remaining photos below were taken a while ago, and some parts were already damaged. Wow! 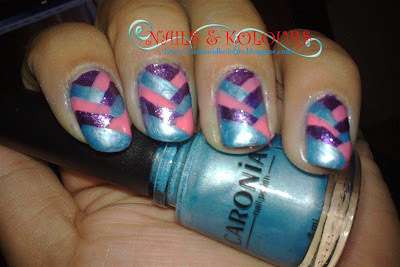 I love this braided nail art.. :D I've just started wearing nail polishes, and I hope I can get a nice nail art soon. love the color, love your nails! Wow! That's so pretty! 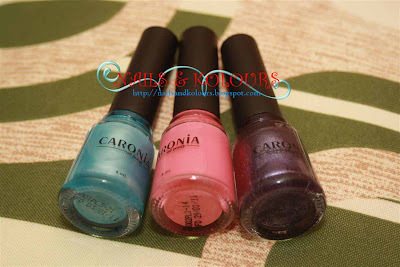 I used to collect Caronia nail polish when I was in high school. I prefer the pastel colors then. But now, I seldom do nail polishing. 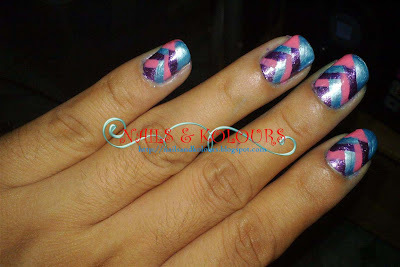 My nails are so small that it would be doubly hard to do this hehehe... you really are good with nail art. I can only ogle but can't do that on my nails. Wow!!! I've learned how to do my own manicure/pedicure but I doubt if I'll have the patience to go far as doing my own nail art, hihi! Kudos to you! I enjoyed checking your nail art. I admire your patience and perseverance. My nails are so weak. Good for you for having good nails to polish with such wonderful colors. It is really nice and fresh look for a no-knowledge like me. Can ou post the youtube link? we might try this one as bonding moments with my room mates. oh! i love the colors! i miss having my nails done. tsk tsk.. i bet if i am still working i wouldn't pass up that design. hmm on second thought, maybe just for a weekend. it's kind of unprofessional for a bank officer. hahaha! The colors are beautiful. KJust curious, how many times do you change your nail polish in a week? 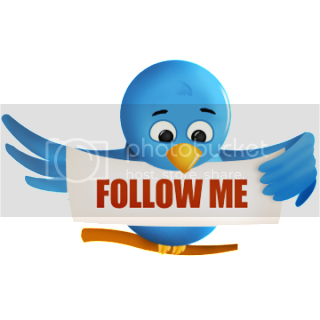 This is cool! I want to try this one. May I know the youtube link? I love this! My most favorite out of all your designs.